There is a new article out in PLoSONE on how the benefits of rebuilding marine fisheries far outweigh the costs. The piece was largely done by the University of British Columbia crew, including Ussif Rashid Sumaila, Daniel Pauly, and Reginald Watson. All in all, I think it’s an excellent cost-benefit analysis of hitting MSY in the world’s fisheries. But…I do have a few critiques on the cost assumptions. Over the past decade, we have gathered data on the economics of global fisheries from a range of sources, including scientific, economic, governmental, inter- and non-governmental publications, to create several global databases on catch; ex-vessel fish prices; subsidies; and fishing costs. From these databases, we compile landed value of catch, cost of fishing, payments to labor, earnings of fishing companies, and fisheries subsidies for 144 maritime countries of the world. From there, the team calculated both current and potential maximum resource rent, wages, and earnings to fishing enterprises. Rebuilding would result in a gain in resource rent of US$66 billion per year, which when discounted over the next 50 years using a 3 per cent real discount rate, generates a present value of between US$660 and US$1,430 billion, i.e. between 3 and 7 times the mean cost of fisheries rebuilding reform. Furthermore, it would likely take just 12 years after rebuilding efforts begin for the gains to exceed the costs of adjustment. Backing up the findings is the fact that the resource rent estimate is similar to the World Bank’s estimate based on a different methodology. The mean resource rent after rebuilding in this study is estimated to be $54 billion. The World Bank’s Sunken Billions report estimated this to be $50 billion. As for my critiques, I think the ‘cost’ side of the equation needs to be better developed. There are two specific areas. First, subsidies. The paper makes a couple very big assumptions about how subsidies will change. Specifically, it assumes that harmful and ambiguous capacity-enhancing subsidies will be phased out and that beneficial fisheries management subsidies will increase by 25% to “support effective management”. The current estimates are that beneficial subsidies run at $8 billion a year, harmful at $16 billion, and ambiguous at $3 billion. I would argue that these assumptions are not realistic. Subsidies will be very, very difficult to phase out in some cases. And why will $10 billion in beneficial subsidies be enough to hit MSY around the globe when currently $8 billion leaves the vast majority of countries failing? And $10 billion will surely be insufficient if many of the bad subsidies remain. Scenarios should have been considered to allow for the possible continuation of bad subsidies and a greater need for fisheries management subsidies. For example, what would the NPV of rebuilt fisheries look like if harmful and ambiguous subsidies were only cut by a third and if management costs need to grow by 150% to prevent illegal fishing and implement scientific management? That would mean an increase in global subsidies by about $6 billion. As a result, the mean rent increase would still be positive, but a bit less than currently estimated. Second, transition costs. The article estimates that transition costs will run between $130 and $292 billion. This is based on an estimate that fishing effort needs to be reduced by between 40 and 60 per cent, or up to 2.6 million boats. And, assuming linearity between boats and people, between 15 and 22 million fishers would need to be moved to other livelihood activities in order to rebuild global fisheries. The unit cost of decommissioning vessels and retraining crew is then assumed be, respectively, the average interest payments on a vessel for five years, and 1.5 times the average annual crew wages. Using various data sources, the average cost of decommissioning large- and small-scale fishing vessels is estimated to be US$55,000 and US$12,500, respectively, and the payout/retraining costs for large- and small-scale fishers to leave fishing permanently is estimated to be US$30,000 and US$15,000 per person, respectively. I ultimately think that more conservative numbers should have been used. Just for the sake of thinking this through, do we really think we can retrain a small-scale fisherman in a developing country to work in an alternative livelihood for $15,000? Education rates are typically low and economic opportunities can be lacking for these folks. And will the government administer such a program? I think the history of government planning shows a very low success rate of reorienting labor. Could these costs not end up being double or triple what is currently estimated? That would certainly cut in to the NPV of resource rent increase net of transition costs (the final line in the above table). 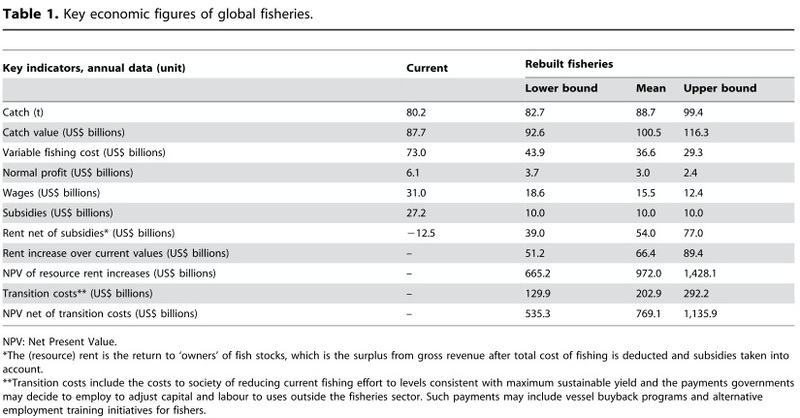 As for the cost of buybacks, another study published earlier this year by researchers at the FAO estimated that buybacks of between $96 and $358 billion would be needed to reduce global fishing effort by 36-43% to hit global MSY. Compared to the Sumaila et al. study, this price tag is quite a bit higher for a reduction of less effort and it does not even include the costs of retraining. It may be that Sumaila et al. have a better estimate, but I’d like to see a discussion of why one might be more realistic than the other. Ultimately, what is the point of these critiques? Am I being a jerk here for poking holes in a clearly needed and clever cost-benefit analysis? Phasing out bad subsidies. I think we need to be more realistic in the marine community about the likelihood of phasing out all bad, capacity enhancing subsidies. The Costs of Expanded Management. More work needs to be done on the costs of scientific management and traditional top-down management to understand what the real price tag is going to be if both are expanded/implemented in management-poor countries. The Efficacy of Re-Training Programs. More work also needs to be done on how to redirect so many fishermen to other activities. The Costs of Alternative Transition Schemes. Rights-based management is not discussed in the Sumaila et al. paper, but I think it should be considered as a possible way to reduce the costs of expanding management around the globe, reduce capacity in the face of continued bad subsidies, and reorient surplus labor using market mechanisms. There are numerous examples of how it has done these things, though certainly is has varied depending on key design characteristics. On a related note, for those interested, see here for information on a possible funding mechanism for the global fisheries transition envisioned in this study.